Since we always seem to have our iPhones in hand, it was only a matter of time before we started inventing alternate uses for them. At ABCey, we’ve scoured our Pinterest for the most outrageous and downright absurd uses for iPhones out there. These just go to show that in the tech world, no idea is too far fetched! 1. Fan | The Doc Fan for iPhone is technically the “coolest” accessory available! Simply plug the fan into the charger inlet of your iPhone and switch it on for a nice breeze during your rush hour commute. Although a fan would be nice sometimes, it must be a serious battery drain! 2. Ultrasound | Who needs a doctor when you own an iPhone? The MobiUS SP1 Ultrasound System is designed to bring affordable and available ultrasound imaging to anyone, anywhere. You can even use this device to take and send pictures to your doctor or relatives but, please, don’t make your unborn child a Facebook page. 3. Bottle Opener | Since we never put down our iPhones anyway, we might as well put them to good use! Next time you’re having brews with your friends, why not use your Intoxicase iPhone case’s bottle opener to help you out? Nothing screams “iPhone replacement” like bending your phone repeatedly over carbonated liquids! 4. The Anti-Lonliness Ramen Bowl | No, we aren’t being sassy. There is really a product with this outrageous name! If you’ve ever had to make the crippling decision between using your hands to eat or to prop up your iPhone, help has finally arrived. Uses include using the bowl’s speaker function to listen to music, video chat with friends, or podcast the morning news over a bowl of cereal. 5. Toilet Paper Holder | Imagine installing this in your bathroom! This iPod speaker system and toilet paper holder combo is for the special consumer who spends a considerable amount of time singing in the shower and requires back-up music. Just try to keep it from falling in, please! 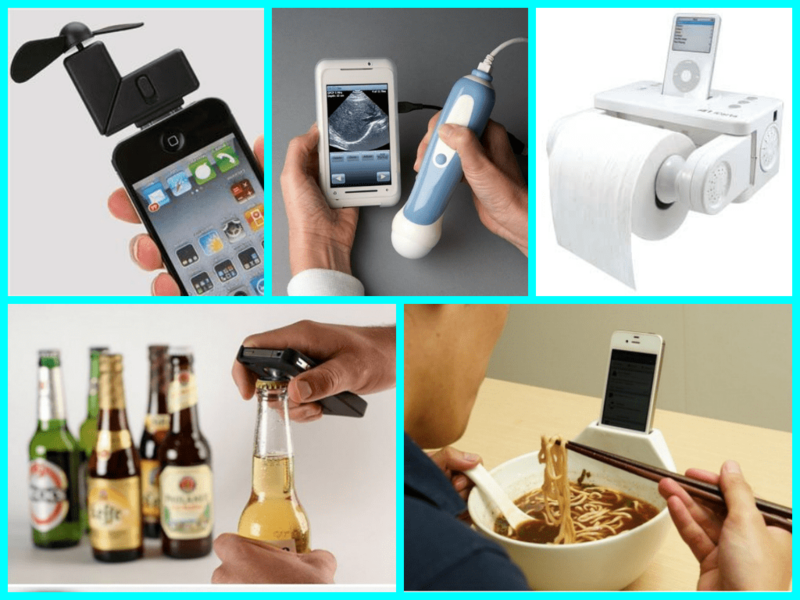 Are these gadgets too bizarre, or would you like to own one? Tell us your thoughts in a comment or on Facebook and Twitter!